When plotting a management course for patients with peripheral arterial disease (PAD), the road map can look like a human vascular system, with possible routes branching off in different directions. Variables such as patient age and overall health, medication use, the presence of implantable devices, and the specialists involved all can influence the course of treatment. Endovascular techniques for the care of patients with PAD continually are evolving. Also changing is where patients can go for PAD treatment, with interventional radiologists opening stand-alone clinical practices or joining forces with combinations of diagnostic radiologists, vascular surgeons, vascular medicine specialists, and/or cardiologists. Such multidisciplinary groups are bringing a new approach to a growing medical problem for the increasing aging population in a changing health care environment, which demands both the best and most affordable treatment options. Matsumoto, who also is president-elect of the Society of Interventional Radiology, explains that conservative PAD management can begin simply with lifestyle changes such as exercise, smoking cessation, and weight loss. These first steps, along with the addition of antilipid and other medications, can go a long way toward helping to improve circulation and increase blood flow in the legs. “Beyond exercise and medication, the question is, when is the right time to intervene?” Matsumoto says. “There are a number of variables to consider when discussing a course of action in PAD. For example, how diffuse is the patient’s vascular disease? Is the patient’s diabetes under control? Do they have obesity issues? All these things need to be considered. “Another factor of PAD management is the increasing role that noninvasive imaging is playing in defining the extent of PAD. Correlating the anatomy with the clinical presentation of the patient allows the interventional radiologist to optimize pretreatment planning for each patient,” he adds. Open surgery is avoided with the use of minimally invasive endovascular therapies for PAD. Thus, patients can benefit from reduced recovery times, less time spent out of work, and perhaps reduced overall health care costs. Decision makers also need to consider which extremities are involved and where in the extremity the blockage is situated. For example, according to Bret N. Wiechmann, MD, FSIR, an interventional radiologist who practices in Gainesville, Florida, blockages located in the lower portion of the thigh and behind the knee require specialized treatment because the arteries in this portion of the leg are subjected to more extreme structural stresses than other parts. Therefore, stents implanted in that region are at greater risk of fracturing. There also is a greater instance of renewed blockages in the lower extremities. Percutaneous transluminal balloon angioplasty (PTA) is the traditional go-to intervention for PAD, Matsumoto says. Recent developments in the procedure involve coating the balloon with a drug that prevents excess scar tissue from forming along the wall of the treated artery without the need for a stent. “They’re still looking at what drug will work the best to effectively deliver [treatment] to the wall of the artery and how long the drug will last at the local site in the artery,” he says. In April, medical technology manufacturer Medtronic announced results of a 12-month trial of its IN.PACT Admiral drug-coated balloon, reporting significantly better outcomes for PAD patients who received the drug-eluting balloon in the upper leg. However, this balloon is approved for use only in Europe and still is an investigational medical device under FDA review in the United States. To date, no drug-coated balloon has received FDA approval. Stents also remain a constant in PAD management, particularly because they work well in the iliac arteries, Matsumoto says. The standard bare-metal scaffold stents used to open arterial narrowing and blockages were the norm until 2012, when the FDA approved the Zilver PTX Drug-Eluting Peripheral Stent (manufactured by Cook) for use in the superficial femoral artery. “These drug-coated stents are believed to reduce the need for repeat interventions by reducing scar formation inside of the stented artery,” he says. Other interventional radiology procedures under consideration include various ablative technologies, such as photo ablation. This treatment involves inserting a catheter into the diseased artery, through which the system transmits laser pulses along flexible optical fibers encased in the catheters. The light destroys plaque and other matter causing the blockage, converting it into particles small enough to pass through the bloodstream. Regardless of the tool used, a tailored approach is needed to achieve the best results, says Warren Swee, MD, MPH, an interventional radiologist who specializes in the treatment of advanced PAD and limb salvage. Beyond the medical issues, interventional radiologists play a critical role in considering each patient’s social circumstance when developing a treatment plan. With this in mind, interventional radiologists can set clear treatment goals and expectations. From the practice side, Matsumoto sees three broad categories for the role of interventional radiologists in PAD management. The first is as part of a diagnostic radiology group with an outpatient clinic and inpatient service that handles vascular cases plus all other diagnostic imaging services. The second is as part of a practice where interventional radiologists belong to a multidisciplinary group that primarily sees patients with vascular disease. This type of group may consist of interventional radiologists, vascular surgeons, and cardiologists or any combination of these three specialties, with the occasional inclusion of diagnostic radiologists. The third category involves interventional radiologists who establish independent practices focused on providing minimally invasive, image-guided therapies both for outpatients and inpatients while also providing comprehensive longitudinal care and ongoing clinical services. Wiechmann finds value in working alongside diagnostic radiologists when treating and diagnosing PAD. He is part of Vascular & Interventional Physicians, a subset of physicians who operate under the umbrella of the radiology practice Doctors Imaging Group. The overall practice includes vascular and interventional physicians, providing a whole-patient approach to PAD management. Wiechmann’s group maintains a free-standing center with three suites where procedures are performed, a preoperative area, exam rooms, a full vascular lab for noninvasive testing, and administrative space. He says combining services is a more efficient approach to medical care and better ensures that patients will continue their long-term care since they need to visit only one location to see their physicians. When looking at the business side of combining interventional and diagnostic radiology services, Wiechmann says it took some convincing to get the partners of his 100% group-owned facility to see the economic benefits. The proposal to add a full vascular lab, positioned as merely an extension of the practice’s existing customer base, initially was met with some resistance, he says. However, by demonstrating a value proposition in which all members of the practice benefitted, partners embraced this new model. The medical community is recognizing the growth of interventional radiology with more formalized categorization of the practice as a medical specialty. In 2012, the American Board of Medical Specialties approved interventional radiology as a primary specialty in medicine. One year later, the American Board of Radiology announced that it would certify interventional radiology physicians in both interventional and diagnostic radiology. On the heels of this decision, the Accreditation Council for Graduate Medical Education approved the formation of a new residency training program in interventional radiology. “The new [interventional/diagnostic radiology] certificate will help bolster the clinical practice in interventional radiology,” Swee says. A physician in one of the first freestanding office-based interventional radiology practices in the country, South Florida Vascular Associates in Coconut Creek, Swee is considered a trailblazer in this new specialty. He was the first resident in a clinically oriented and specialized interventional radiology residency, the VIR clinical pathway, at the University of Virginia. He continued on at the university, completing a fellowship in vascular and interventional radiology. In his seven years of practice, Swee has worked in two separate interventional radiology groups. The first was a hospital-based, two-physician group, and currently he practices in a three-physician freestanding group. The freestanding practice provides an alternative for patients who prefer to have their procedures performed outside the hospital. 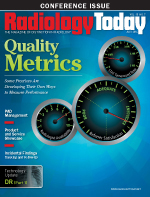 One way to manage the interventional radiology relationship with other physicians is through marketing and communications efforts, Benenati says. Something as simple as word of mouth stemming from a successful case can go a long way with referring physicians. In the end, interventional radiologists agree that proving the interventional radiology’s viability as a safe, reliable, and cost-effective option in the treatment of PAD will help make it easier for interventional radiology and multidisciplinary practices to proliferate and for the interventional radiology specialty to be identified as an all-inclusive vascular medical alternative. — Kathy Hardy is a freelance writer based in Phoenixville, Pennsylvania.